15 March - 14 October. 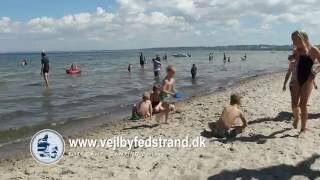 Vejlby Fed Camping is an attractive and well cared for site, close to the beach. It is also close to Middelfart and not far from Odense, the birthplace of Hans Christian Andersen. The site is on level, grassy ground with gravel access roads and provides 243 numbered pitches on several large fields. Some of the spacious, level pitches are separated by low bushes, others have no separation. There are views of the sea from the fully serviced pitches. With 145 places for touring units, seasonal guests take up the balance. The owners tell us that the beach is child-friendly with shallow water for about 30 m. out to sea. Close to the site entrance is a fenced, gated and well maintained, square swimming pool (heated) with a little slide and a paddling pool for toddlers. There is also a Lego room with a street circuit woven into the carpet and, in high season, two entertainers for children. Three toilet blocks with modern fittings, child-size toilets andwashbasins, family shower rooms. Baby room. Facilities for disabled visitors. Washing machines and dryers. Campers’ kitchen. Motorhome services. Shop. Takeaway. Swimming pool (5x12 m). Sauna and solarium. Playground. Tennis. Minigolf. Fishing. Watersports. Pedalos and boats for hire. Pony riding. Entertainment programme for children (high season). Live music and barbecues. Free WiFi over site. From Kolding follow E20 east towards Odense and take exit 58 towards Strib. Continue to Vejlby and Vejlby Fed.